It humbles me to hear how Portland, Maine’s Falls of Rauros have developed since their previous LP Hail Wind and Hewn Oak. It humbles me not only because I have been a resident of northern New England all of my life and always thought the region to be friendly to (yet somehow devoid of) black metal aesthetics, but because it is always a pleasure to hear a band’s concept come into fruition right before you. The Light that Dwells in Rotten Wood is just that kind of album – one that shows a band taking criticism with intent to silence those who have spoken out against them in the past. The album is a tighter, focused and more concentrated piece of atmospheric black metal, taking folky acoustic guitars and sliding them with grace between the intensity of the album’s heavier passages in much the same way as their stylistic counterparts across the country in the Cascades. Don’t make the mistake of bulking the likes of Falls of Rauros amongst more well-known acts like Agalloch or Wolves in the Throne Room, because there is something more grounded here that is easier to connect with on a basic level. The Light that Dwells in Rotten Wood is extremely accessible, yes, but that does not mean there is little here to savor for those who have been around the block, so to speak, with the genre. Comparatively, everything Falls of Rauros have done here exceeds their previous releases. The production is clear and audible, allowing the bass to be felt and the acoustic passages to be warm and sorrowful. The clear division between melody and intensity found previously on Into the Archaic or Hail Wind and Hewn Oak is fused together here in a way that makes transitions between the two flowing and smooth; indeed each element is absolutely critical to the success of the record as a whole. Had the melodies and harmonies of the acoustic and electric guitar been kept distant from the heavy chords or the crashing drums of guest drummer Austin Lundr of Panopticon fame, the album would be a heartless, atmosphere-devoid shell that could easily be swept under the rug and forgotten. 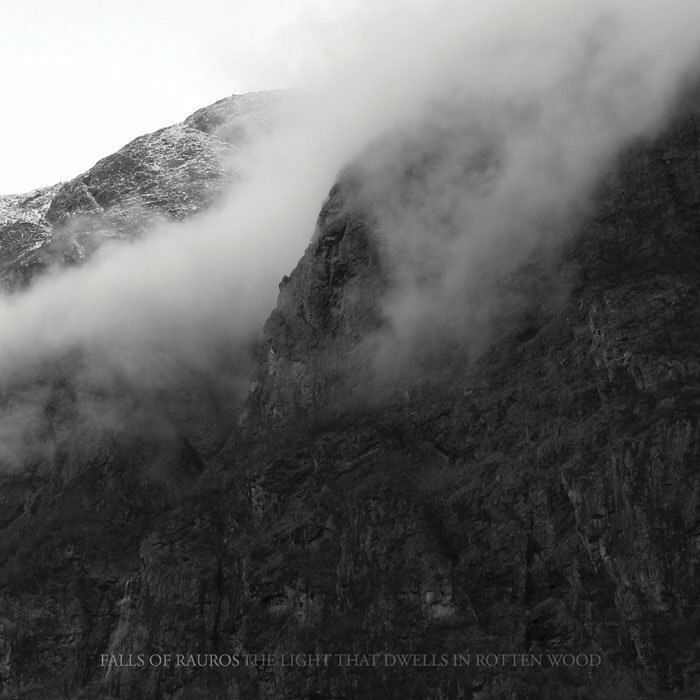 Falls of Rauros, though, have the songwriting talent to keep this from happening by allowing things to be varied. Not varied in a sort of trivial way that pits lackluster acoustic chords against tireless tremolo riffs for 45 minutes, but varied in a more colorful sense. Even the intensity of “Banished”, the heaviest track on the album, is scarred with an incredible, harmonious guitar solo and instrumental dismantling that leaves the pace collapsed before it slowly begins to lift itself up again. Almost before you know it, the outro “The Cormorants Shiver On Their Rocks” is easing you out the door in a radiant instrumental. That’s the kind of album this is. The Light that Dwells in Rotten Wood is simply a beautiful album, there are no two ways about it. Its pacing is flawless and its length is just right at a tidy 44 minutes. The vocals, placed a tad high in the mix, remain as high-pitched wails throughout almost the entire album, but don't become tiresome due to their quality. Its only bane is its lack of originality – this style has been done more times than I care to count. However, sometimes refining a sound you play well to a knife-edge can lead to great things, and that is what I will take out of this album. It lacks pretenses and isn’t trying to be something it’s not, and to its benefit the album emerges above its genre contemporaries for this specific reason. Falls of Rauros could still develop their sound further to make it more uniquely their own, but The Light that Dwells in Rotten Wood is as perfect a stepping stone as you could ask for to follow this path. Purists will hate it, undoubtedly, but the style and aura coupled with the execution will keep me coming back to The Light that Dwells in Rotten Wood for quite a while. And that, really, is the only test that has merit down the road. I doubt that will happen with the rec's by reviewer. Good review also as usual man. Yeah I think that too but whenever a new album comes up in this vein it is asking for a slew of 2.5's from the audience here. And he put a review up for it, sounds like a definite turn around from into the archaic. Pos man. Don't know if this is for me or not, but we'll see. And he put a review up for it, sounds like a definite turn around from into the archaic. Miles better. Definitely give this a listen. awesome review, I love stuff like this if I'm in the mood for it so will check it out, pos'd. The first track had me worried but "Banished" is proving great so far. Shouldn't that second sentence start off with "It"? It reads like a fragment if you start the new sentence without that pronoun there. Yeah probably, I'll change it now. Thanks. All right, cool. I didn't know you had your own blog. I don't update it as much as I'd like to (probably gets new posts once every 3 or 4 days) but I try. It's not really that kvlt sonic but yeah cover rules. I'll look into that band. Banished is a tune for sure.